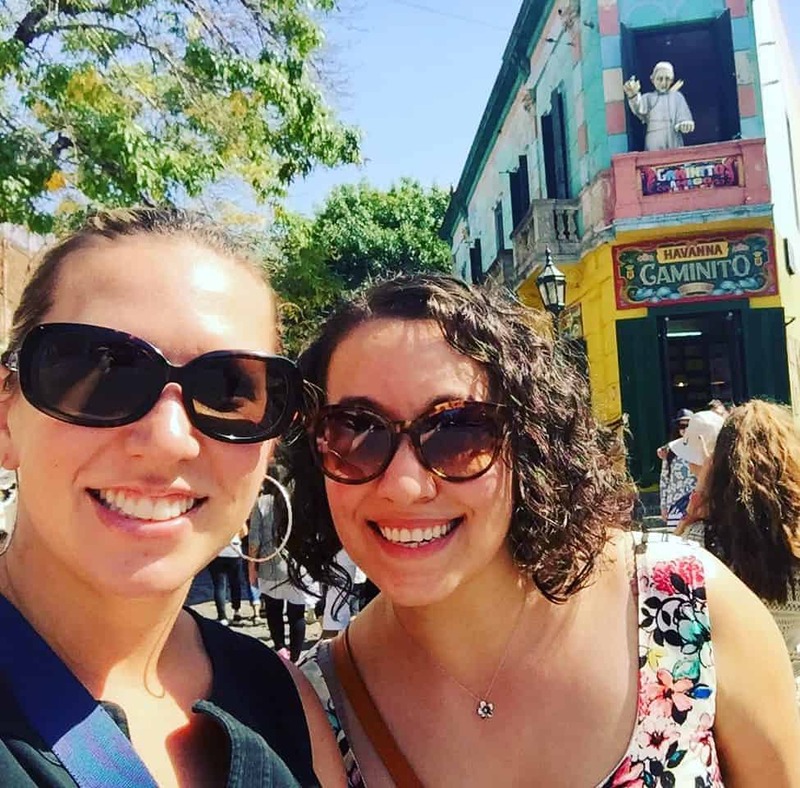 My friend Sarai and I have a history of epic adventures, but our girls’ trip to Argentina is right up at the top in terms of life goals. We spent seven days basking in Argentina’s stunning landscapes, marinating in delicious wine, steak, and pastries, and soaking in the culture. I’d recommend it to anyone, and often go on conversational tangents about how amazing Argentina is. But because Argentina is so massive and has so may things we wanted to visit, planning the trip took a ton of work figuring out where we wanted to visit, narrowing things down based on feasibility, diving into transportation logistics, and trying to pack everything in. 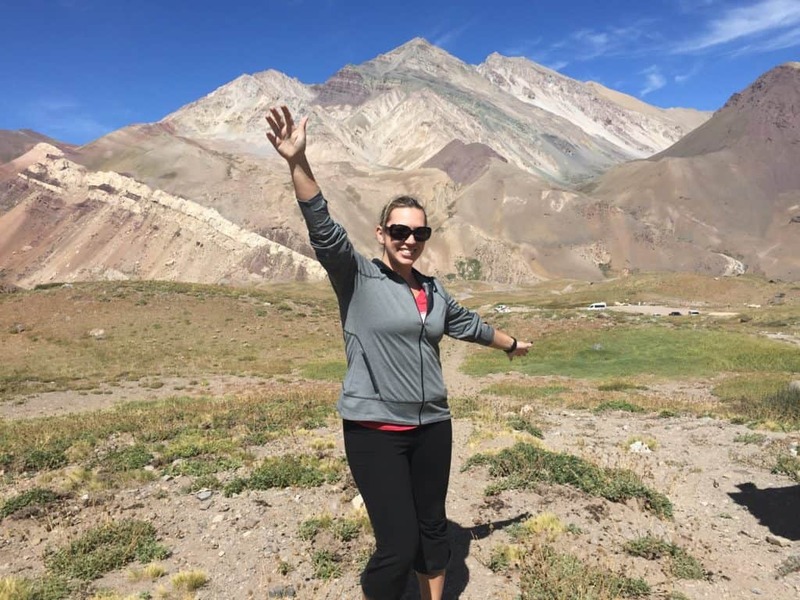 So I’ve done the legwork for you, and am giving you my tips for how to plan the best Argentina itinerary, to make your trip planning process a lot smoother! Did you know? Argentina is a land of natural beauty superlatives. The country—the 8th largest in terms of land mass—has not only the biggest waterfall system in the world, but also the highest mountain peak in the Americas. 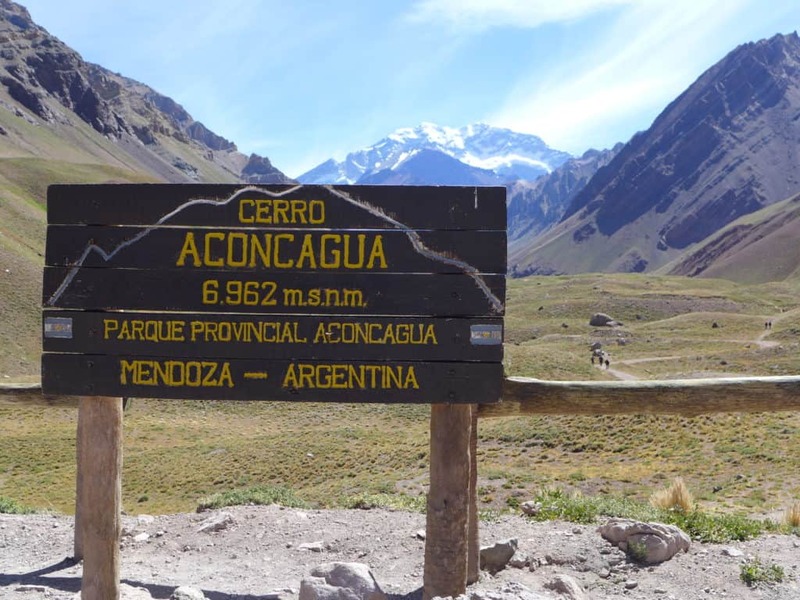 At 6,962 meters (23,036 feet), Cerro Aconcagua is the highest peak outside of the Himalayas! The highest active volcano in the world is also in Argentina, not to mention one of the biggest glaciers you can actually visit semi-easily. So what do you need to know to plan an amazing trip to this INSANELY huge country?? With just a week, we had to focus, so kept our visit to the north half of the country. The winery areas around Mendoza were our primary focus, but I knew I also wanted to fit in a visit to Iguazu Falls if at all possible. Since I was so bummed about missing out on the Andes down in Patagonia, I made sure we got a taste of the mountains in Mendoza as well. And that left us with just a day or two to spare, so Buenos Aires was the logical addition, since we flew in and out of there. 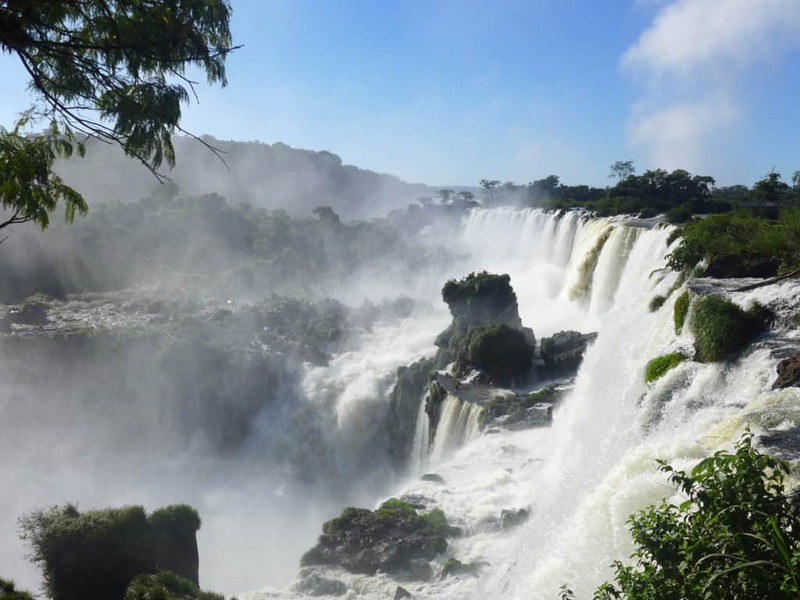 One of the most frustrating things is that Argentina is so massive that you can’t possibly visit all the different things on your list in just one trip (unless that trip is 4 weeks or longer…). 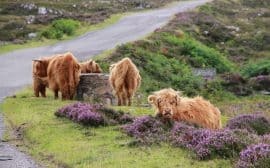 My wish list for this trip was SO long, and so there were definitely a few things I had to sacrifice in our itinerary. You should definitely look into them if they’re up your alley, and depending on time of year. Patagonia – It KILLS me that we didn’t get to visit. But we were visiting in late March (so weather conditions and visibility potentially starting to get dicier), and the significant travel time, cost, and only having a day or so on the ground made this just not feasible. But I’m dying to return and see Perito Moreno Glacier and do some hiking. Ushuaia/Tierra del Fuego – the southernmost tip of Argentina (and the world, minus Antarctica), this is the jumping off point for Antarctic travel and also just super cool. Salta, Jujuy, Cayafate, etc. 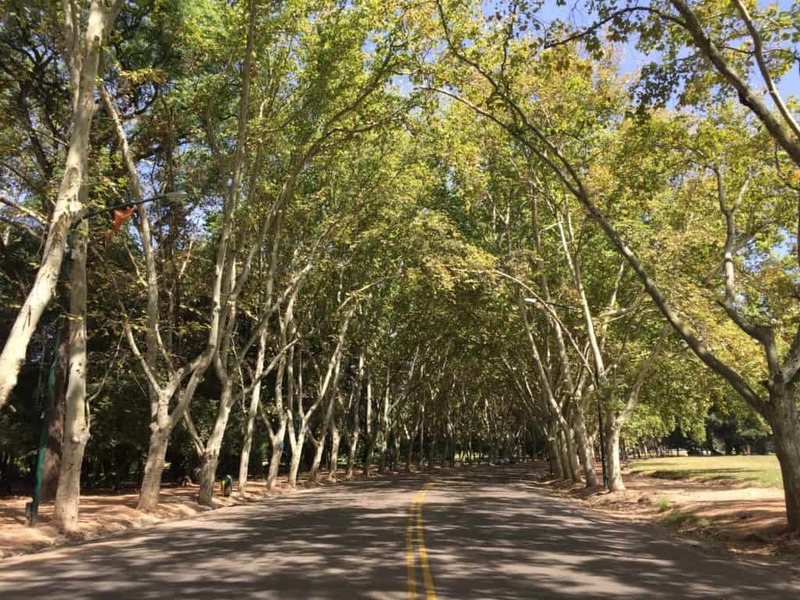 – Beautiful, stark scenery, more wine country, and free of crowds…what’s not to love?? You could do this instead of Mendoza, if desired. Do you need a visa to visit Argentina? For U.S. citizens, as of publishing (December 2017), you do not need to pay the reciprocity fee any more. This was lifted in August 2016 (a few months after I visited, dangit!). However, this could change at any point based on the political climate, so make sure you check the U.S. embassy website (and TripAdvisor forums) to be sure. Last I checked, Canadian and Australian passport holders still do have to pay the fee. If you are required to pay the reciprocity fee, make sure you have your paperwork printed and with you—the one with the barcode! We ran into some trouble before we even got on the plane. We’d purchased the visa/reciprocity fee online, and printed our confirmation emails, but didn’t have the actual document with the barcode we needed (it was an attachment in the email, which we didn’t realize). The Delta gate agent was super patient and helped us finally figure out how to access it as we were trying to board, but don’t be me. Make sure you trip gets off to a smooth start: 1) If you need one, save your reciprocity fee log-in, 2) find the document with the barcode that will be sent to you, 3) PRINT IT!!! Follow One Girl, Whole World on Pinterest for more travel tips & inspiration! Travel in between places is going to be one of your biggest logistical challenges, because things are far apart and you also have to assume there will be some flight delays. They’re VERY common. So you’ll lose quite a bit of time to travel, and you need to pad your flight times and layovers to be safe. We got in around 9:30am and it took about an hour to get through customs, then we got our luggage and caught a bus across town to the domestic airport. The bus took 2 hours though (I thought I booked the fast one, but apparently not?? ), so if you’re in a hurry then a taxi is the better bet. We had plenty of time though—I’d booked our flights for later in case of delays—and once we walked across the street from the airport and grabbed lunch from a food cart. 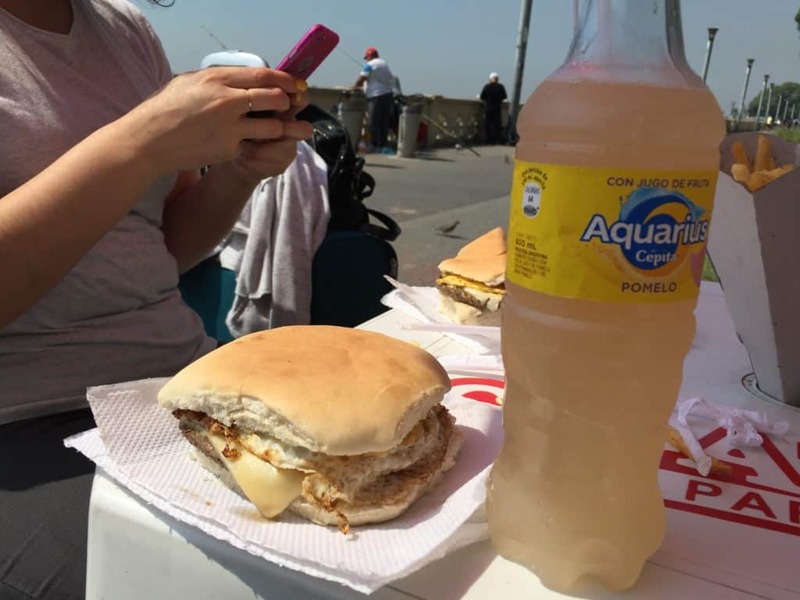 It was relaxing just basking in the sun, downing our hamburguesa and grapefruit soda, and watching the old men fish. 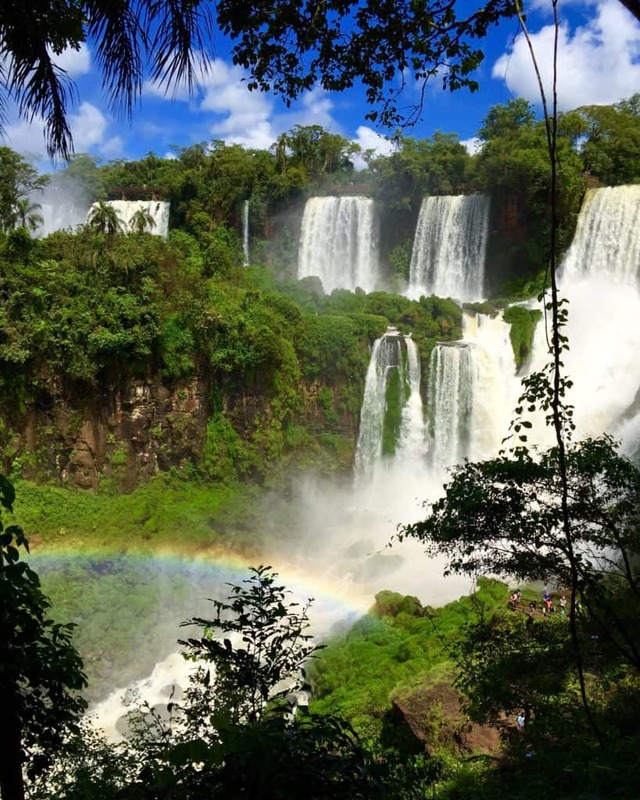 The first stop on our Argentina itinerary was Iguazu Falls. Our flight to Puerto Iguazu was on time, landing around 6:30p. Our Airbnb host arranged for a taxi to pick us up to make sure we got a fair price, and took us to our adorable apartment. Once we got settled in we found a great-sounding place to eat called AQVA, about a 15-minute walk away through residential areas. It was super dark but we didn’t feel unsafe. We each had steak, shared an appetizer, and shared a half bottle of wine for only $40 USD total! The next morning we were up early to catch a cab to Iguazu Falls. We wanted to get the local bus, but couldn’t find it for some reason, so the cab just made more sense. It should be about 230 pesos each way for the cab (we paid 200 there, 230 back). 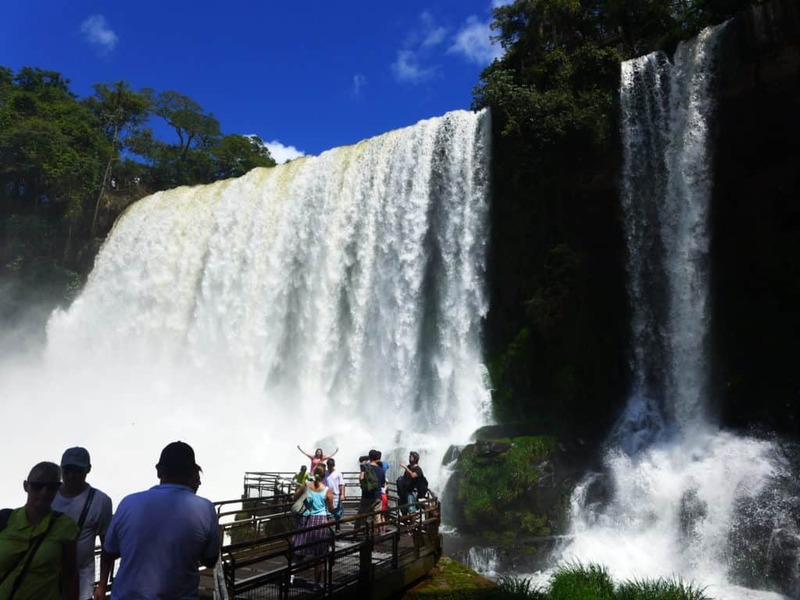 Read this post if you want all our tips on seeing the falls, how to avoid the worst of the crowds, what order to see everything in, how to catch the boat, and much more. It has everything you need! 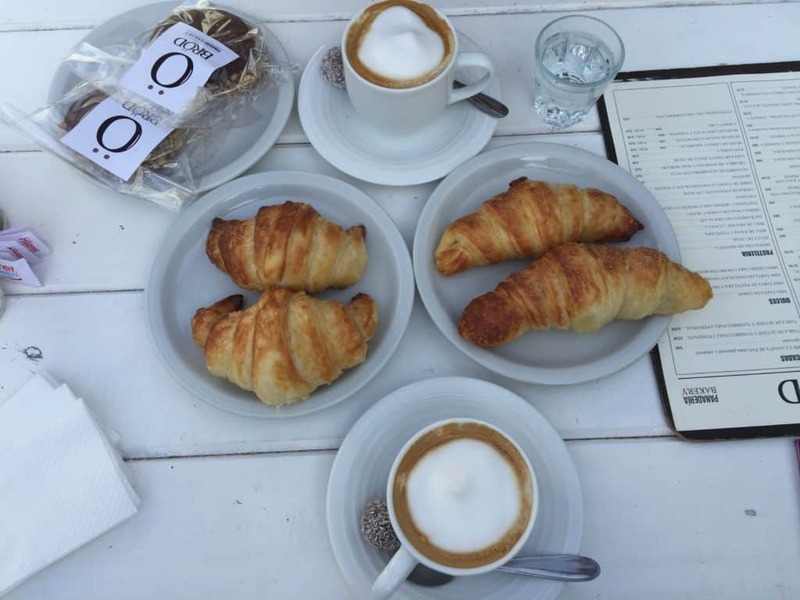 I got up early the next morning to find awesome pastries and coffee, and enjoy a little bit of Puerto Iguazu. 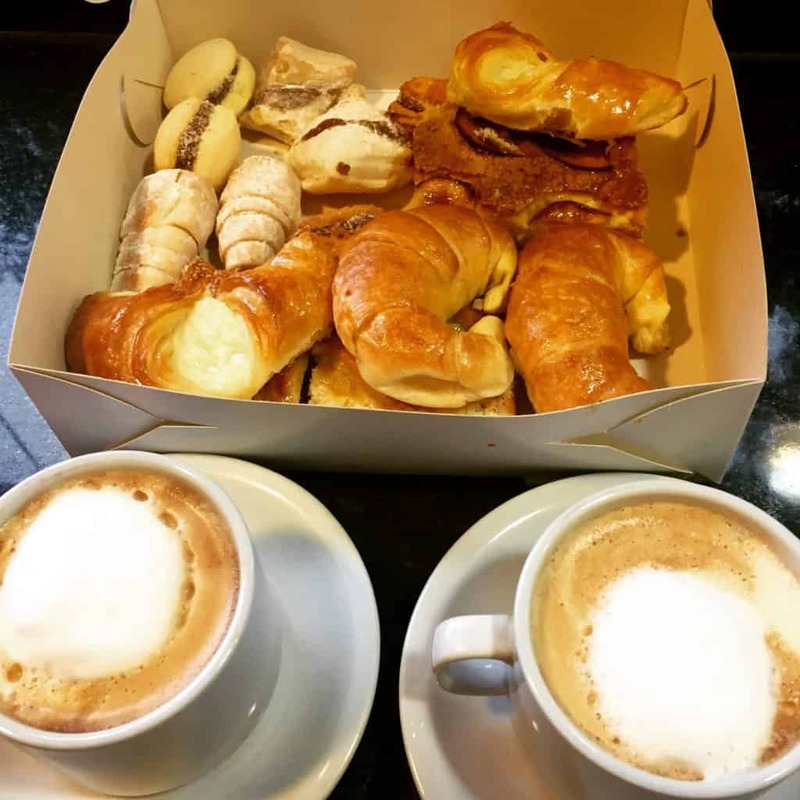 This entire box of pastries and two cappuccinos were less than $10 USD! The medialunas are always my favorite—they’re like if a croissant and a brioche had a slightly sweeter baby. By the time we got to the airport it was POURING and our flight was already delayed by the time we checked in for our flight, then eventually cancelled (the airport even lost power briefly). We ran to get in line and got on a flight leaving for Buenos Aires instead, which was already boarding and we had to sprint for as well. We spent quite a long time in Buenos Aires (that flight was delayed a few hours too), then finally made it into Mendoza pretty late that night. Make sure you build in lots of extra time for travel, because delays ARE going to happen! Our experience with Aerolineas Argentinas was largely very good, and their snack game was on point. The only major issue we had was a whole day of flight delays and cancellations, but that was mostly weather-related and not their fault. We spent four days based in Mendoza, and yet we actually didn’t spend gobs of time in the city itself. Which is really a shame, because it’s so charming! It’s a great size, with great food and beautiful tree-lined streets (due to the ingenious irrigation system they have). 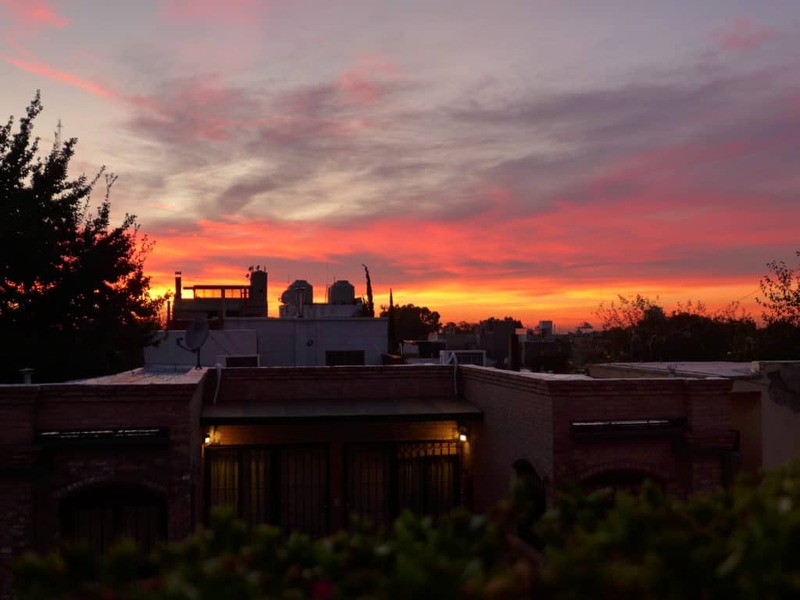 We stayed in a cute Airbnb right in the thick of things, which let us walk pretty much everywhere, and with a gorgeous sunrise and sunset view. 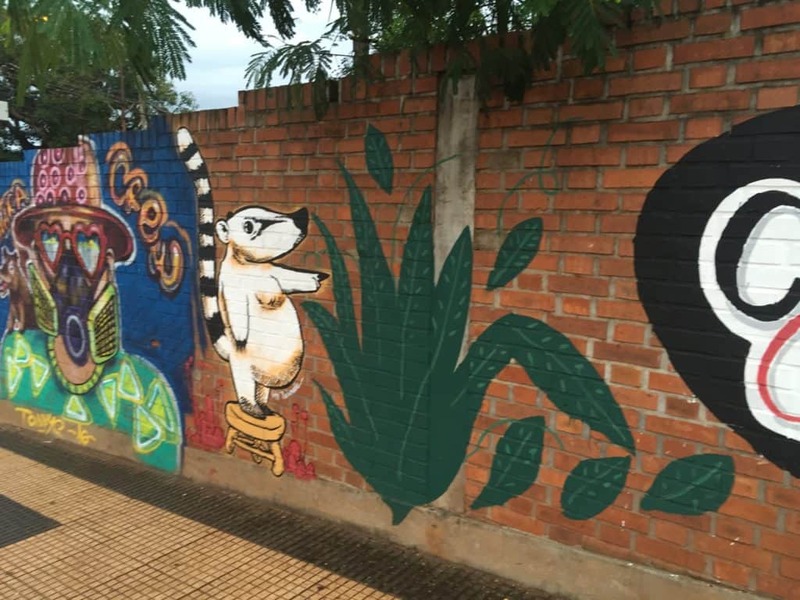 Mendoza also has a cool street art scene, which means you can discover lots of fun hidden gems as you walk around. Though there are lots of stray dogs, people actually take care of them (kind of collectively) and they’re well-behaved, seem healthy, and are totally sweet and adorable. I had a couple who decided to join me for my morning run and then followed me home, and boy it was hard not to want to keep them! 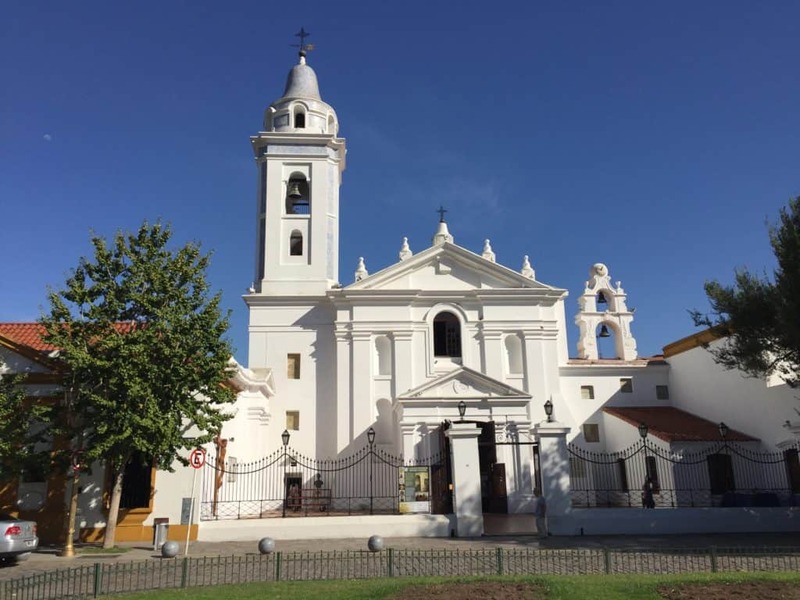 We were really using Mendoza as our base for visiting the amazing wineries nearby, and getting up into the Andes as well. Looking for ways to make every trip amazing? Download my free e-book, “Epic Trip Planning 101”! 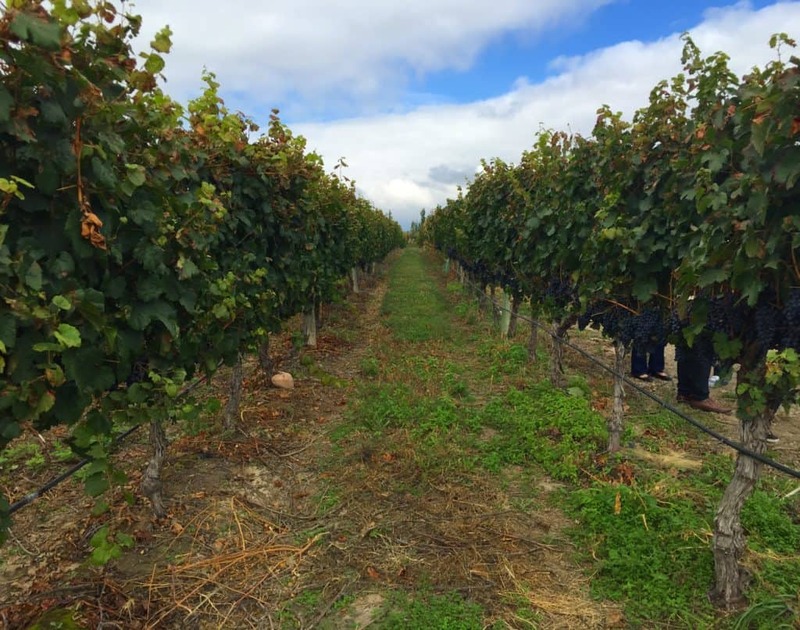 It’s no secret that Mendoza is now famous for its wines, and we planned the trip with wine country in mind. Not specifically because we were completely in love with Argentinean wine, but more because it’s clearly a place where amazing food and wine are revered. 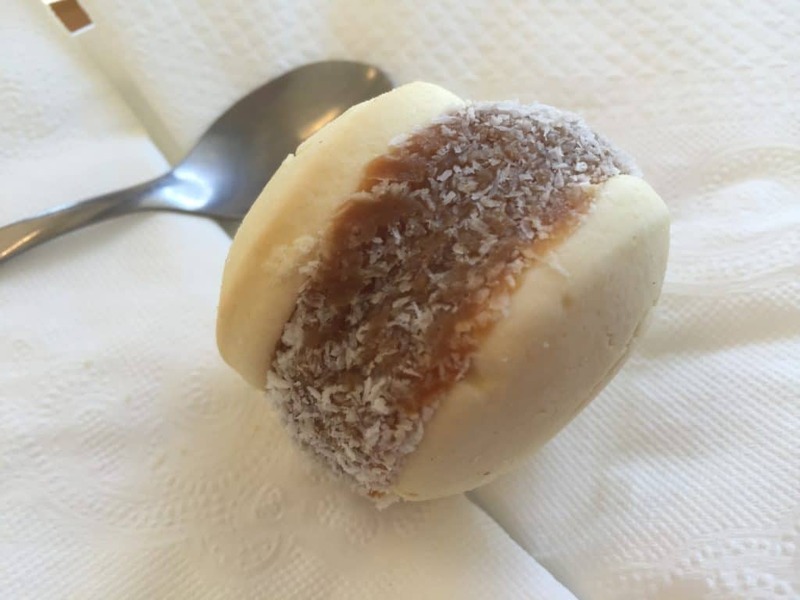 A true foodie culture. 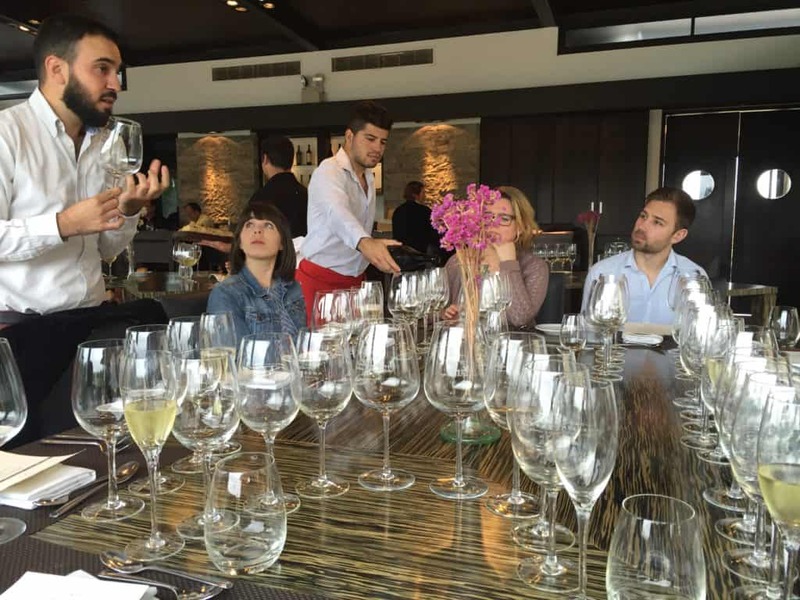 We spent two days with Ivan from Trout & Wine Tours, and had an awesome time. 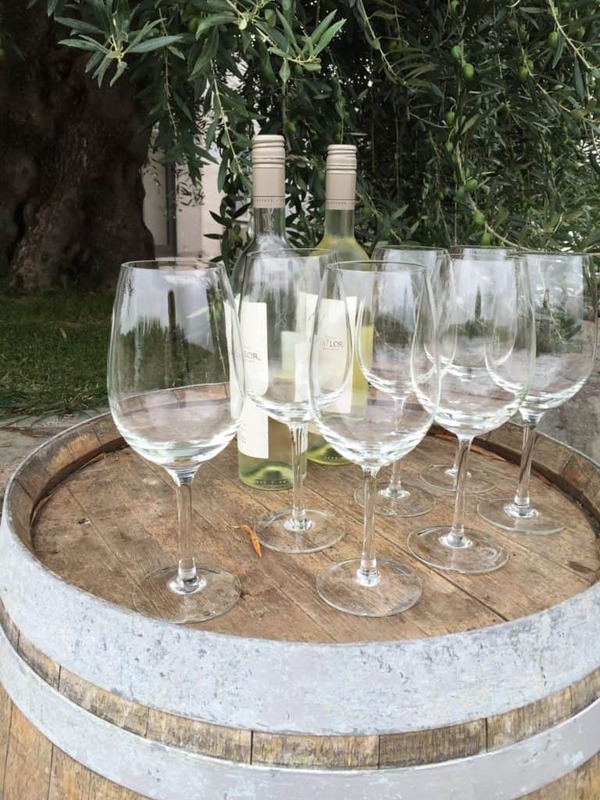 I’ve outlined a ton about the wine itself, Mendoza’s different wine regions, and our experience with all seven wineries we visited in this detailed post about Mendoza winery tours. 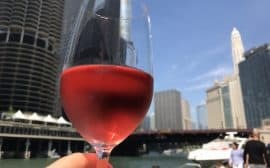 Over the course of the two days we visited seven different wineries and had different experiences—sometimes a normal tasting, sometimes a tour of the facilities as well, training on how to identify different tastes or smells, or how different types of foods change the taste of a wine. All throughout, we learned so much about the winemaking process and the history of the industry in Argentina (Ivan recommended this book, which I read when I got home & totally recommend!). And each day we had the most AMAZING meal at one of the wineries. They ended up being two of the best meals I’ve had in my entire life! Because I wasn’t able to work Patagonia into our itinerary, I was determined to get us into the mountains one way or the other, so Mendoza was our best bet. 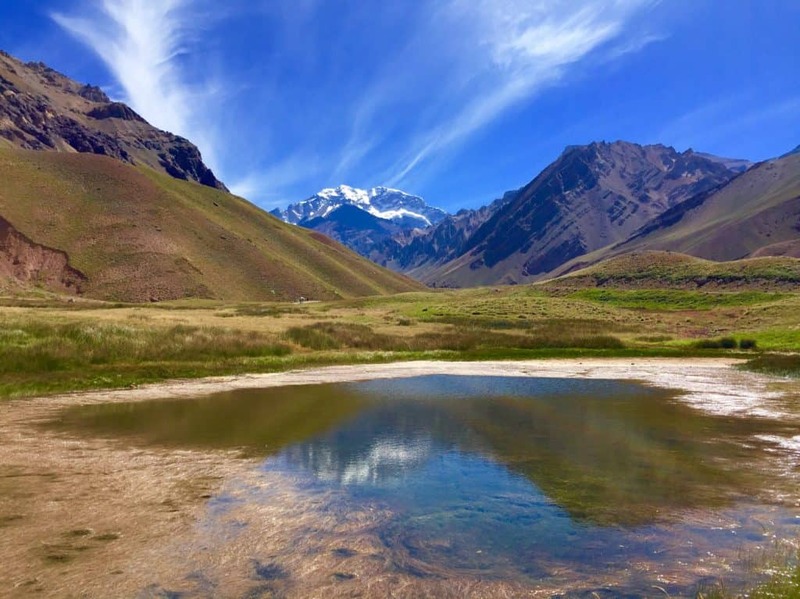 After some some research, I decided to do an Andes tour with the same company as we did our winery tours (Trout & Wine), though there are ways you can do this self-guided as well. The tour worked perfectly for the time we had, however, and since we were visiting on Easter this helped us make sure that we didn’t run into issues with things being closed (which was a real problem). 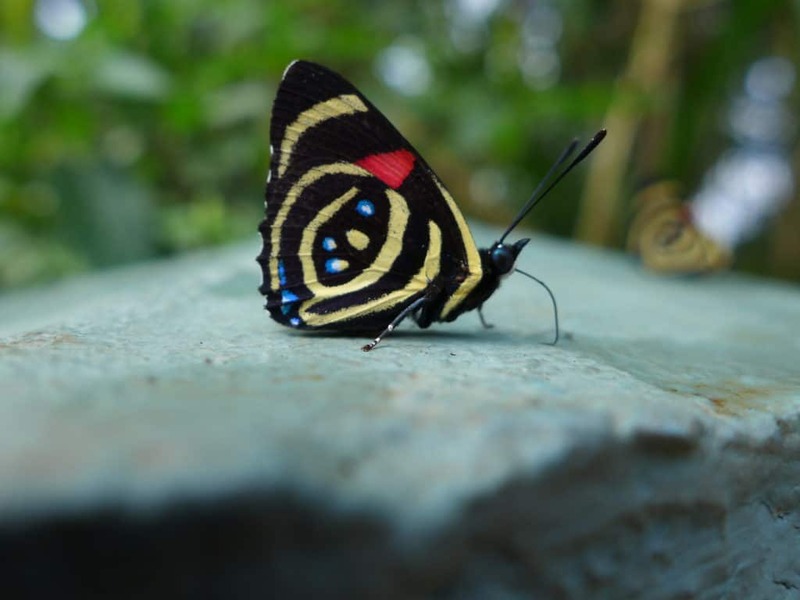 I go into a ton of detail about it in this post about our Andes adventures! 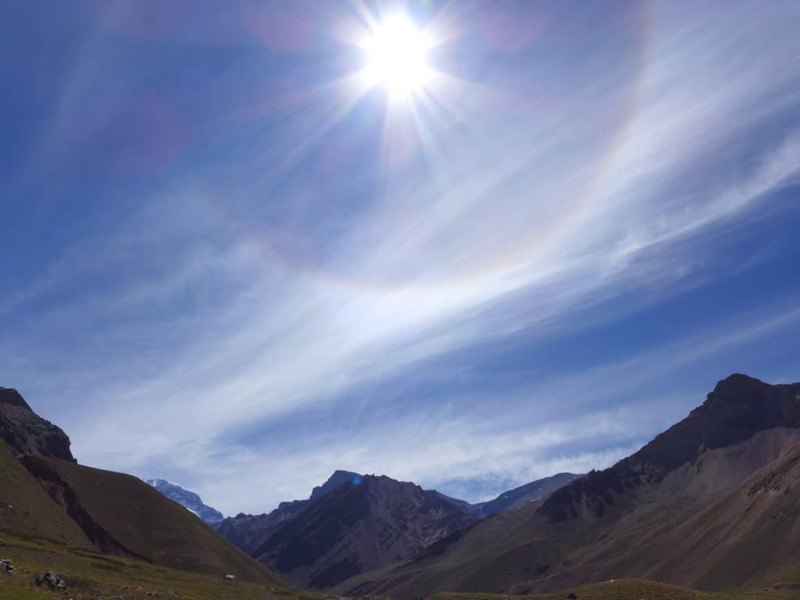 We left Mendoza early and stopped about an hour later at a town for some medialunas and coffee, and to stretch our legs and continue to acclimate to the altitude. Later, our guide Ricardo shared some of his mate tea with us. 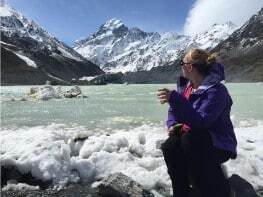 Not only is it supposed to help with altitude sickness, it’s also a big part of Argentinean culture and something that friends and family share with each other constantly. 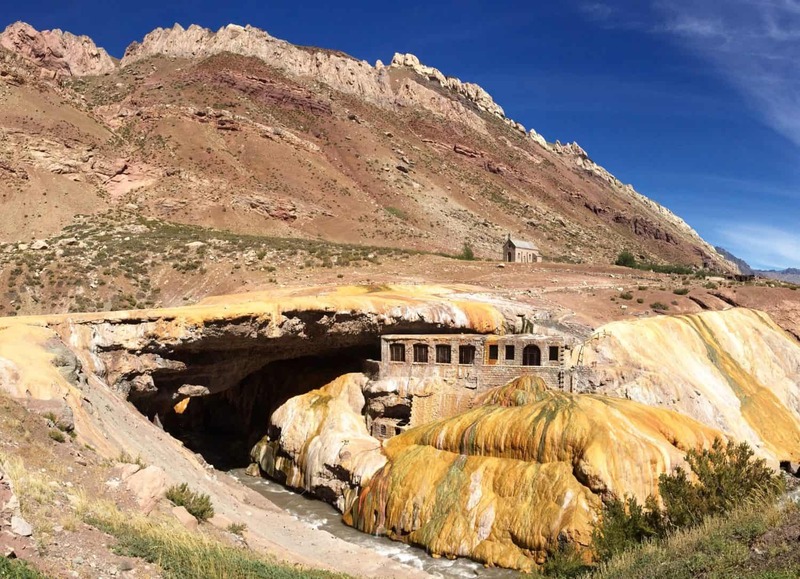 One of our next stops was Puente del Inca, something you may have seen on your Pinterest feed from time to time. 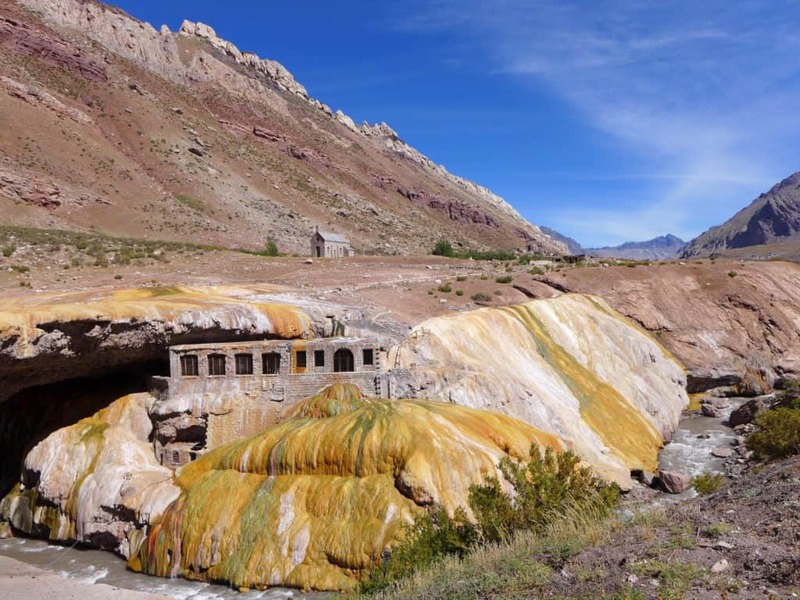 It’s a bright natural stone bridge over Rio de las Cuevas, the bright oranges and yellows caused by sulfuric sediment. We made a few stops throughout the morning, and then reached the place of our “hike”. This was really more of a walk than a hike, so if you’re looking for something intense then I’d try something on your own. But this was perfect for us. 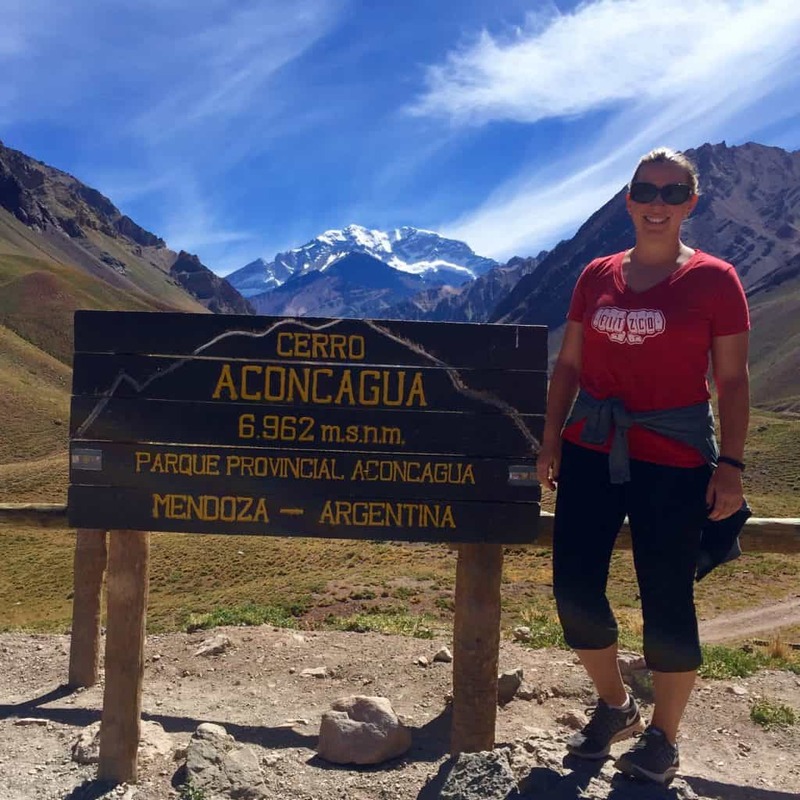 We walked on largely level ground for about an hour, with the most amazing weather and clear views of Cerro Aconcagua. I was also obsessed with this striped colorful mountain opposite Aconcagua, which we dubbed Cerro Amazeballs. On our way back to Mendoza, we stopped in a small town for a traditional asado lunch. It was full of local families celebrating Easter, and we sat and drank wine and ate all manner of meats, just basking in the warm March day and feeling like we belonged there. After spending the next morning walking around Mendoza, we caught a flight back to Buenos Aires for our last day in Argentina. 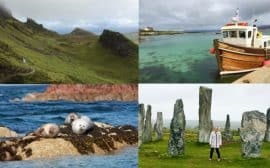 Obviously you could spend an entire week here, and it’s ideal to have 2-3 days in a new city to explore, but there’s still a TON you can see with just one day. You just need a game plan. We stayed at a cute Airbnb in Palermo, so were pretty central to everything. We got in pretty late at night due to flight delays (yes, more), so after dropping our bags we had the taxi driver take us straight to dinner at Don Julio, where we had a reservation. 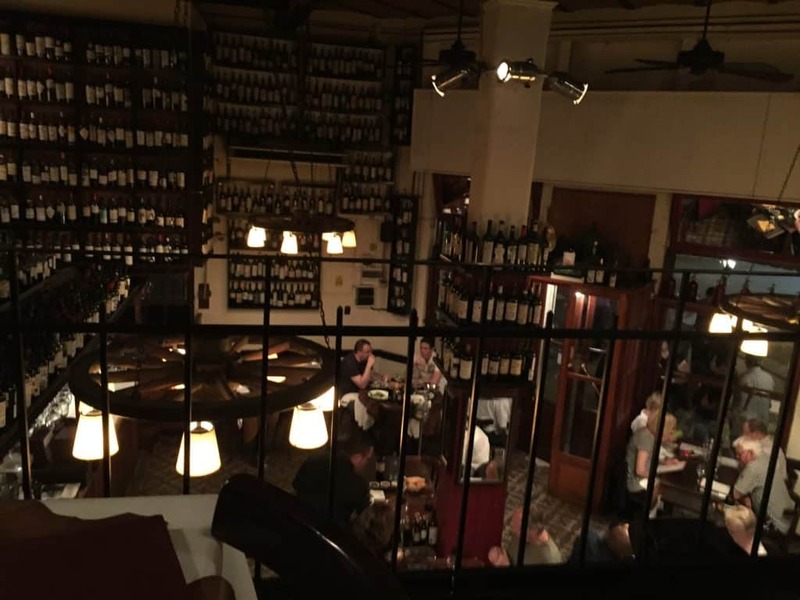 A traditional steakhouse is a must in Argentina, but particularly in Buenos Aires. Knowing time was short, we got an early start the next morning and headed toward delicious coffee and pastries. 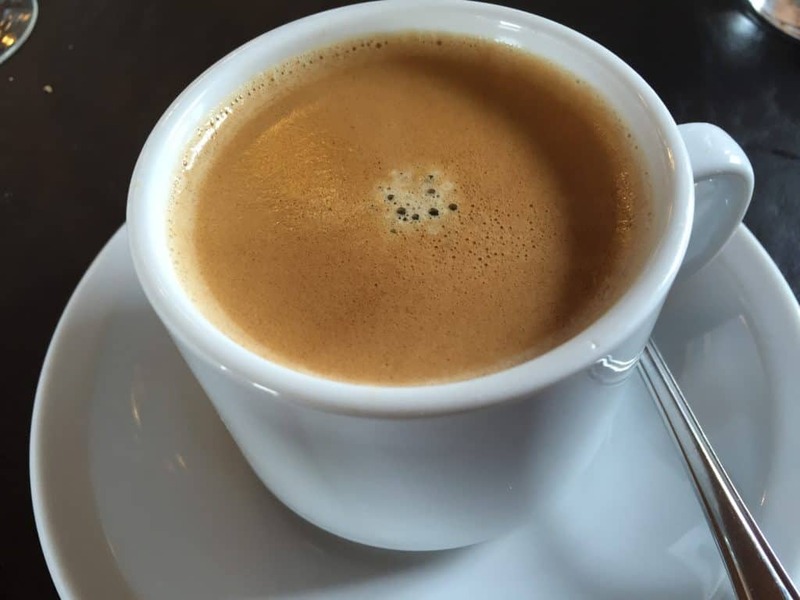 There are soooo many options for this in Buenos Aires (delish coffee!) but I was dying to try out Felix Felicis, a Harry Potter-themed coffee shop in the adorable Palermo Soho neighborhood. From there we headed to Recoleta Cemetery (and got to see a cool military ceremony) and the fabulously huge El Ateneo bookstore (that used to be a theatre). Finally, starving, we took a cab over to San Telmo and sat down for lunch and a tango. It wasn’t a great lunch, but was a gorgeous day out on the patio and the tango demonstration was pretty cool! 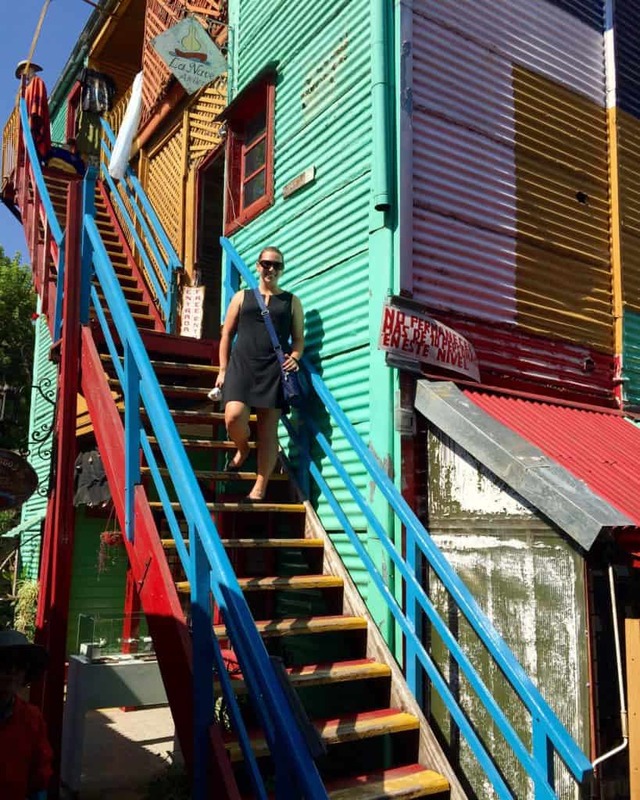 And then to round out our whirlwind tour of this charming and vibrant city, we took a cab over to La Boca with our little remaining time to see the colorful buildings, then it was off to the airport. So, that’s how we planned our epic week-long Argentinean adventure! We really covered a ton of ground in seven days, and I’d recommend this trip to anyone—we totally fell in love with the country, the culture, the food, and the landscapes. Have I convinced you to book a ticket to Argentina right this minute?? Are you planning a trip to Argentina? What questions do you have that I haven’t answered here? Leave me a note in the comments or shoot me an email and I’d love to help! Awesome!!!! 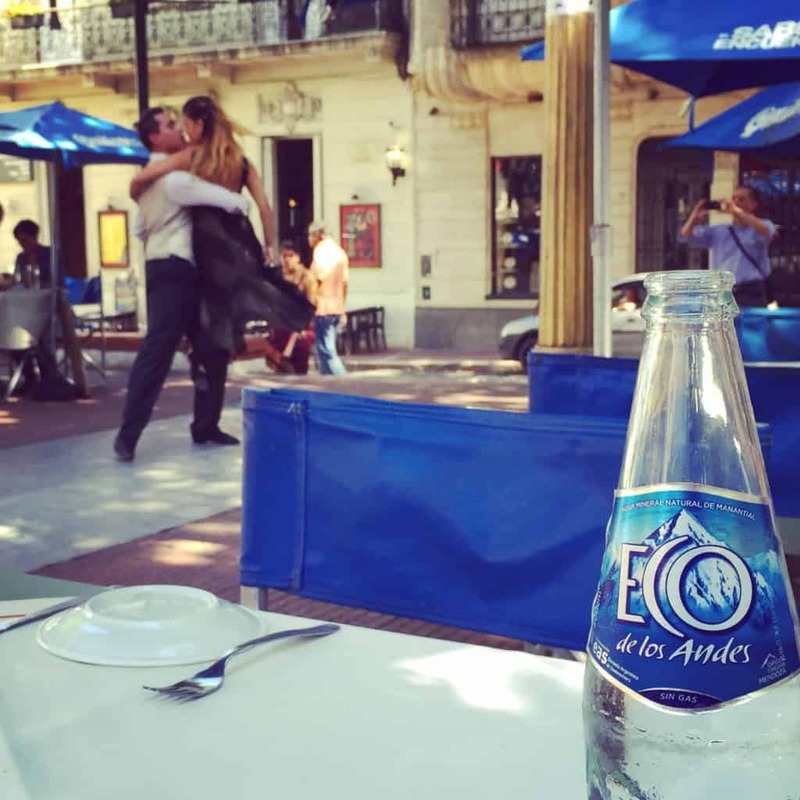 7 days in Argentina! Wow. You were on the move FAST! 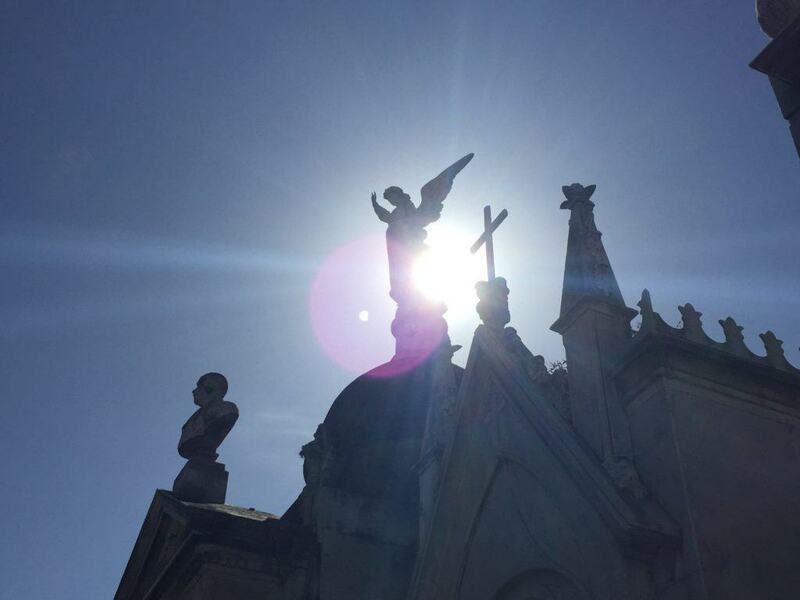 I spent 2 months in Argentina and feel like I still missed a few things I want to see. I am going back in a few weeks to the Quebradas in Jujuy (It’s the first place I really left my heart in, and it will be my 3rd time visiting the same small town). It’s a magical country. You packed in a great itinerary for a week. A lot of the major highlights. Did you fly from place to place? We did, just due to distances…I looked into the overnight buses but they were still soooo long. I’d love to go back and spend more time, a week was barely scratching the surface but I feel like we got a good taste! Those photos from the falls are stunnningggggg. I would love to make it down there someday! Pinned for future reference! Wow- this post is awesome. Now I want to get on a plane & go to Argentina! Your photos are beautiful too ???????? Looks like a wonderful glimse into Argentina! Some beautiful shots too! Oh my, I thought I was already in love with the food and then I saw the library! I will definitely add it to my bucket list! Also, the wine seems amazing! I think a lot of people pay attention to the Chilean wine and forget that Argentina has great grapes as well. Loved the article!